I've been trying out a new hobby as of late. I'm sure a lot of you have seen the nail art videos that plague the internets, mainly Facebook, and yes I was sucked in. But in my defense, I am an artist, well a wanna-be-artist, and so to me getting artsy on a nail is just a smaller canvas really. 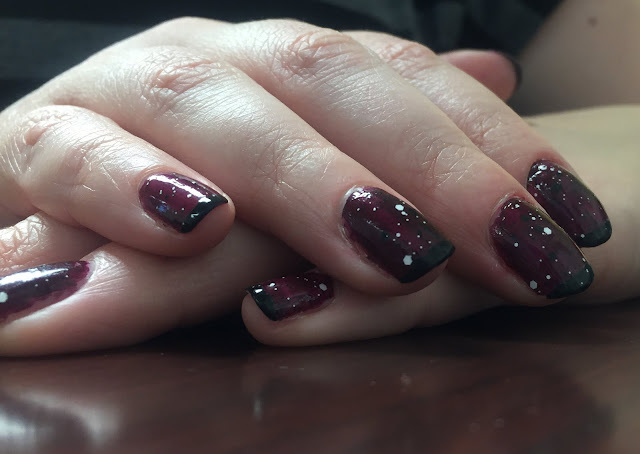 I've only been doing this for a couple months now, and mostly it's been on my own nails, which has been a major thing for me in and of itself (I don't like my nails painted. I know go figure). But I'm starting to feel like I'm actually getting the hang of this thing, and I enjoy trying to come up with new designs. So I thought I'd share some of the ones I've done thus far, and will post an update from time to time of additional designs I come up with. 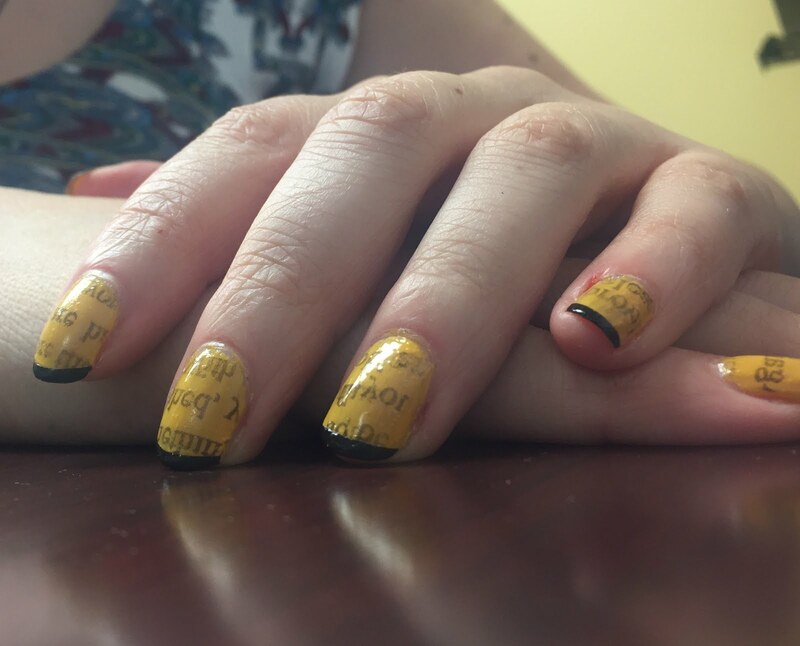 I then attempted to do my friend Jordan's nails, and quickly learned I'm not that great on someone else. I have better control on my own nails, which is odd. This was my first try at a sponge technique which came out quite well for a first try. 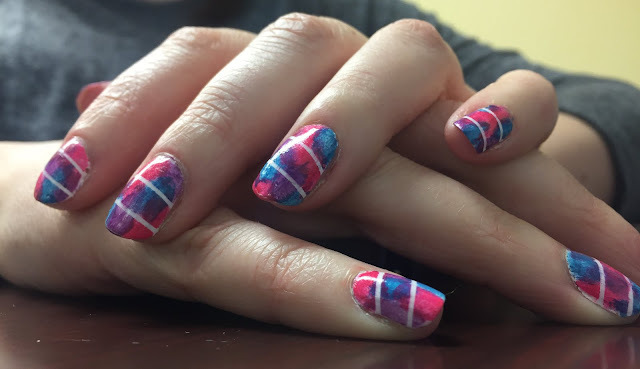 This was also my first attempt at using strip tape to create a design, and learned I need to let the paint dry a little longer before removing the strips. It's all a learning process for sure! Thanks for indulging me in this new little hobby of mine! And for those wondering, each painting has lasted me nearly two weeks, a few only a little over a week, but a clear base coat and a couple clear top coats do wonders for longevity. Here are a few more that I've done this year. I've kind of had to give my nails a rest, as they just don't handle the painting so well. Is this normal for others? Anyway, enjoy! This one involves the use of newspaper. After watching a video I thought I'd give it a try. It's actually quite simple! You just need some newspaper and rubbing alcohol, and voila! This one was a quickie as I had Salt Lake Comic Con to go to, and a picture with Stephen Amell. I wanted something green (The Green Arrow) and sparkly on the good old middle finger, as I had decided we'd pose flipping the bird to "F Cancer". The picture turned out great even if you can't really see my nails. I know, and that's all that matters! Fall is here! And this was my first fall attempt. I love the copper color, and a fun little stamp on the ring finger and thumb added just the right accent. 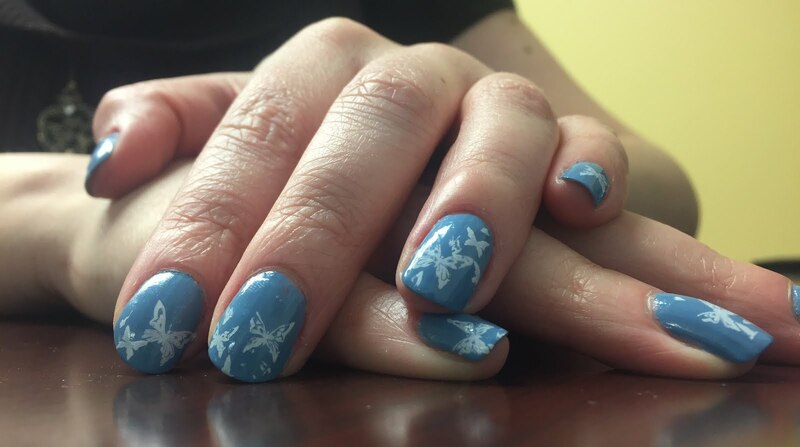 I think this design is a perfect winter design, so ignore the fact that I did it in the summer. I'd just bought the paint and wanted to give it a whirl. With a little silver strip in the middle and some glittery paint to add some fun, I loved how this one turned out.